41 days packed with Adventure! The Nairobi to Cape Town overland tour is basically the same as the tour from Cape to Nairobi. The big difference is the direction of course, but on this tour camping and accommodated clients will travel together the entire 41 days. This tour covers all the highlights of the 21 day East African Adventure (South) + all the highlights of the 20 day Vic Falls to Cape Town tour. You will see lots of wild animals and the numerous safaris during this trip. We visit some of the most legendary National Parks in Africa such as the Serengeti, the Ngorogoro Crater, Chobe, Etosha, South Luangwa..
Leaving behind the bustle of Nairobi we travel south to the Tanzanian border to begin our epic adventure over 41 days to Cape Town in South Africa. After completing border formalities we continue to the busy town of Arusha, our base for the night. Northern Tanzania is home to the Serengeti, Ngorongoro and Kilimanjaro. Those who have purchased the optional Serengeti Excursion upgrade package will be briefed this evening by our local guide on what to prepare for the coming days. Although it is a short distance to Karatu, we will spend most of the day commuting closer to the Ngorongoro Crater. Upon arrival in Karatu, our guide will brief us on the full day excursion into the crater. Karatu is conveniently situated to allow you the opportunity to participate in various optional activities in the coming days. Please note: This morning, those guests who pre-purchased the Serengeti excursion upgrade will be collected and will be separated from the group for the next 4 days). See all the details in the 2019 Tour dossier, or click here. We rise early and will be collected from our camp and transferred to the Ngorongoro Crater in 4x4 safari type vehicles. We will spend the bulk of our day exploring the crater floor in search of the animals which roam the plains. We will arrive back in Karatu in the afternoon. Please note: Clients who are not joining the Zanzibar Excursion will remain in Bagamoyo for the duration of the Zanzibar Excursion. Accommodation includes breakfast and dinner daily, but lunches are not included for the duration of the Zanzibar excursion. Today is an open day to enjoy some of the many attractions and activities on offer. Water sports are the order of the day and Nungwi offers fishing, snorkelling, scuba diving and a variety of ocean safari options. Whatever it is you chose to do today, you will have ample opportunity to create some island memories. Rent a scooter and explore the many attractions on offer or simply relax on the beach and soak up the sun. Our visit to Nungwi comes to an end today as we travel back to Stone Town in the afternoon. Boasting a rich history this busy port was once a landmark on both the Slave and Spice trade routes. We spend our final night on the island on the beaches south of the port city. This morning we have an opportunity to explore the historic area of Stone Town before catching an afternoon ferry back to Dar es Salaam and overnight back in the town of Bagamoyo. Stone Town represents the historic centre of Zanzibar Town and is a must see for those with an interest in history, culture and the unique architecture of the historic port. Leaving the coast behind us we travel inland and make our way to Mikumi where we stop for the night. Mikumi National Park ranks as the fourth largest park in Tanzania and forms part of a 75 000 square kilometre wilderness that centres on Selous, Africa’s largest game reserve. We rise early this morning and enjoy an extensive game drive (safari) in the Mikumi National Park. This afternoon we continue to the southern highlands of Tanzania and our final stop in Tanzania. Leaving Tanzania behind, we descend the Great Rift Valley and cross the border into Malawi. Known as the “Warm Heart of Africa” the lakeside country is blessed with natural beauty and our destination tonight is the shores of Lake Malawi where we look forward to spending the next two days enjoying the attractions of the northern regions of the lake. This afternoon we will enjoy a visit to a local community. Snorkelling in the crystal waters offers the chance to see first-hand the brilliantly coloured tropical cichlids, tiny fish often found in colourful aquariums around the world. Today is free for you to enjoy a relaxed day on the shores of lake Malawi. For the more adventurous amongst us, use today to participate in the Livingstonia hike. This is a strenuous hike that takes between 8 - 12 hours to complete. Your guide will provide additional information on the hike. This morning we board our truck and head further South of Lake Malawi. Our destination tonight is the shores of Lake Malawi. Stretching over 500km along the western boundary of Malawi, the lake is home to more species of fish than any other lake. We spend the night on the shores of this natural wonder. Today is another day of leisure, relaxing at the lake. Use the time to read a book, soak up the sun or indulge in the many attractions that are on offer. This morning we enjoy a final sunrise on the shores of Lake Malawi before setting off for Zambia and the South Luangwa National Park. After crossing the border into Zambia we make a short stop in Chipata before continuing to our camp on the banks of the Luangwa River. Having watched the sun rise over Lake Malawi in the morning we enjoy an equally spectacular sunset over the Luangwa River this evening. South Luangwa National Park is a world-class safari destination and we have a full day to explore the park in search of the variety of wildlife found in the park. This morning you can join an optional morning safari or during the dry season (April to December) you can join one of the iconic walking safaris on offer in the park. This afternoon we will enjoy a Sunset Drive in the park, enjoying a sundowner (a drink while the sun goes down) on the way. The unique opportunity to explore the park at night gives us a chance to spot the elusive nocturnal species that are rarely seen in the day. 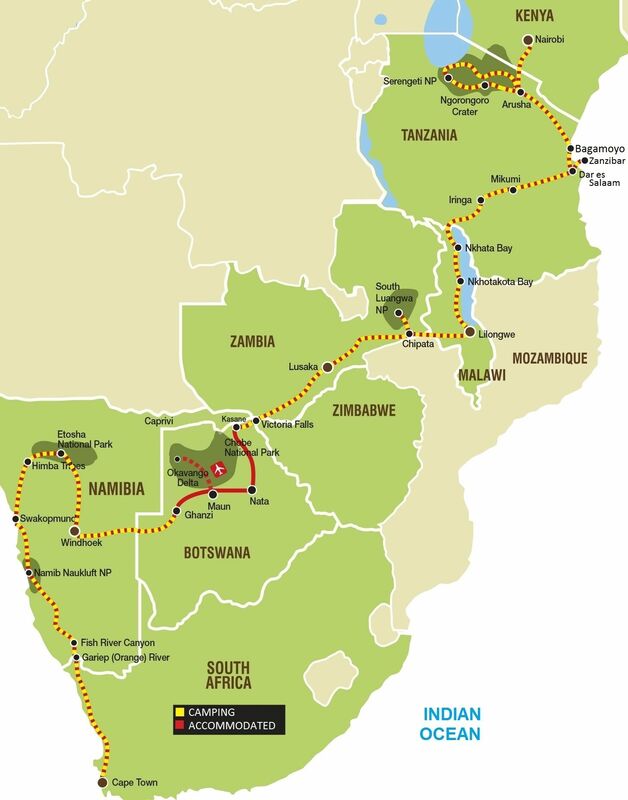 As an important link between Lusaka and neighbouring Malawi, the Great East Road winds through rural Zambia and we will cross the Luangwa River on our way to Lusaka. The route today is dotted with villages and subsistence farms and the landscapes serve as a stark contrast to the developed countries so many of us call home. Crossing the Southern reaches of Zambia we make our way to the adventure town of Victoria Falls. This afternoon we get our first look at the mighty Victoria Falls. Crossing the bridge between Zambia and Zimbabwe we get a view of “Mosi oa Tunya”, the Smoke that Thunders as the falls are known in the local language. Victoria Falls offers a host of optional activities and these can be booked on arrival in Victoria Falls. 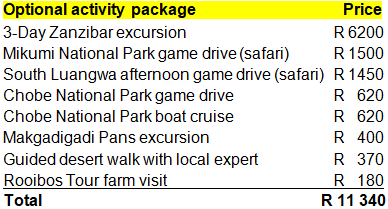 There are lots of optional activities to do in Vic Falls and your guides will help you make most of your time here. For the more relaxed traveler there are craft markets and coffee shops on offer as well. Tonight we enjoy an optional dinner out, your guide will assist you to decide on the many options available. After breakfast we travel the short distance to the Botswana border, crossing into Botswana to set up camp on the banks of the Chobe River. For those who have purchased the activity package we begin our exploration in 4x4 vehicles and enjoy an afternoon game drive through the Chobe National Park followed by a boat cruise in the afternoon, which allows us an up close and personal experience with the many elephants that frequent the Chobe riverfront in the afternoon. Leaving Kasane early, we set off for Nata where we will overnight. Our activity package will afford us the opportunity to enjoy an afternoon guided excursion to the Pans and Nata Sanctuary to appreciate the spectacular view and a sundowner. Our journey today takes us across the northern reaches of the Makgadikgadi Pans and the road to Maun is lined with majestic views of the iconic Baobab tree. Upon arrival in Maun, you will have the opportunity to enjoy an optional scenic flight over the Okavango Delta (time and weather permitting). * Note: Those guests who have pre-purchased the Okavango upgrade package – will be transferred into the Delta today and will re-join the group after the Delta excursion. View all the details here. The most rewarding and enjoyable way to explore and experience the beauty and serenity of this intricate system of lily covered channels and lagoons is by mokoro. Heading out early, we will be transferred by safari vehicle to the poling station (approximately 1 hour transfer) where we will meet the polers who will be escorting us into the Delta. The polers will steer us through the serene area of narrow, reed lined channels which open out onto beautiful lagoons. Reaching one of the many islands, a nature walk may be taken with your poler. After the walk, we return by mokoro through the channels back to the poling station. While the mokoro trail is not primarily a game viewing activity, a variety of game may be encountered in this pristine wilderness area, including elephant, giraffe, kudu, impala and zebra. We travel to the Ghanzi district in the central Kalahari and this afternoon we enjoy a guided walk with our San hosts. This is an opportunity to learn more about the San culture and interaction with their Desert environment. Tonight we get a first-hand experience of the San culture, well known for its rich traditions of song, dance and story-telling. The nomadic San are hunter-gatherers that have passed down a rich knowledge of the plants and animals that play such an important part in their lifestyle. We start early this morning as we continue west and cross the border into Namibia, travelling onwards to the capital city of Windhoek. Upon arrival in Windhoek, we will take a short walk through the city centre and have the opportunity to view some its better known landmarks. (Our accommodation for the night is situated halfway between the city and the airport). We leave Windhoek early in the morning since we have a full day of driving ahead of us and will reach the gates of Etosha National Park in the late afternoon. We begin with our first safari (game drive) as we enter the park and travel the short distance to our overnight rest camp for the night. Etosha is the venue for some of the most unique wildlife viewing experiences in Africa. Today we have a full-day to explore the edges of the Etosha Pan in search of the abundant wildlife that occurs in the park. Our truck offers us an elevated platform and we will spend some time at the many waterholes dotted throughout the park. We will rise early and enjoy our last game drive through Etosha as we make our way to the gates and exit the park. Sit back and enjoy the scenery of rugged mountains and dry river beds. The Brandberg (Burning Mountains) are regarded as the highest in Namibia and home to the famous White Lady, one of more than 45,000 rock paintings in the area. After reaching our destination for the day, this afternoon we will make the 1-hour hike to visit the painting that is said to be around 2,000 years old. (Please be advised that the hike does traverse rough terrain along the gorge of the normally dry Tsisab River). The massive granite formations of Spitzkoppe tower 700 metres above the desert plains below and the presence of rock art indicates their significance to the San people who lived here many years ago. We will enjoy a walk with a local guide and have the opportunity to view some examples of the San’s rock art before setting off for the seaside town of Swakopmund. Swakopmund is well known for its many adventure activities, coffee shops and rich German influence. This evening you will have the opportunity to book some of the many exciting activities on offer and we end the day with dinner out at a local restaurant. Today is an open day to enjoy adventure, explore Swakopmund or simply enjoy a great bake at a local coffee shop. Swakopmund offers all the conveniences of a little city and there is something to keep everyone busy. This welcome brush with civilization is the perfect launching pad as we venture to the Namib Desert tomorrow morning. Leaving behind the charms of Swakopmund we continue our journey to Southern Namibia and the Namib Desert. We make a short stop in Walvis Bay this morning before turning east towards the heart of the desert. Our afternoon will be spent with a local guide who will introduce us to the wonders of the desert environment. An early night is advisable as tomorrow will see us up as the dawn breaks. Rising at first light we travel to Sesriem, the gateway to the Sossusvlei dune fields. We enter the park early and make a stop to climb the famous Dune 45. Having stretched our legs we continue deeper into the Dune fields and take a 4x4 transfer to the marvels of Sossusvlei. We take time to visit both Sossusvlei and Deadvlei, before bidding the dune field farewell. Our final stop before continuing to our camp is the interesting Sesriem Canyon, a remnant of much wetter times in this dry region. We turn east and head for Keetmanshoop, where we will spend our afternoon meandering through the quiver tree forest. Contrary to belief, the quiver tree is not really a tree, but a plant that can grow to between 200 – 300 years old. Our safari continues with a visit to the Giants Playgrounds, named for the way in which the massive dolerite boulders have been placed on each other- creating rock formations and a series of mazes. We board the truck and travel south on the gravel byways of Southern Namibia on route to Ais-Ais. Famed for its hot springs the resort and its hot pools are the perfect tonic to ease away the dust of the Namib. The Fish River Canyon is one of the largest in the world and this afternoon we take a walk along the rim of the canyon and end our day with a memorable sunset on the canyon edge. As dawn breaks we head out making our way to the Orange River and our final stop in Namibia. Our last night in Namibia is spent on the banks of the Orange River and the best way to experience the Orange River is by canoe. This afternoon you will have the opportunity to partake in an optional canoe trip on the river. A final border crossing sees us enter South Africa this morning as we travel through the desert landscapes of Namaqualand on our way to the Cederberg region. If you are fortunate enough to be travelling in the spring months (July to September) you may encounter the wild flowers that have made this region famous. No matter the time of year though, the strange desert vistas offer a unique backdrop to this day’s travel. Tonight we enjoy a traditional meal and celebrate the many memories we have made. The Cederberg region not only boasts spectacular mountains and orange farms, but it is also the home of the Rooibos bush and this morning we will visit a working Rooibos tea farm and see the plants of Rooibos and Buchu that occur naturally in the wild. Indigenous to the mountain slopes of the Cedarberg, this herbal beverage has earned an international reputation as a healthy and refreshing alternative to regular tea. Nearing Cape Town, you will notice Table Mountain appear in the distance and we will stop to look at Table Mountain from across Table Bay. Your tour ends upon arrival in Cape Town city centre.